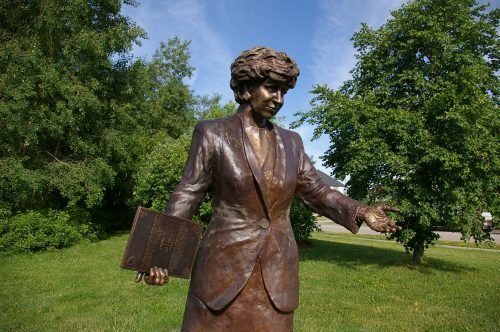 This year’s Prime Ministers Path unveiling of a bronzed Kim Campbell at Baden’s Castle Kilbride caught the attention of the Globe and Mail. “Make yourself comfortable, Kim Campbell. Our 19th Prime Minister just moved into pleasant new digs, surrounded by Sir John A. Macdonald, Sir Robert Borden, William Lyon Mackenzie King, Lester B. Pearson and – given time – everyone else who’s ever held Canada’s top job. Why have these statues ended up in Baden, you may ask?